I seem to be stuck in a fashion rut these days. Very happily stuck, I might add. Happy to pull on what has become my style uniform this summer. For running around doing errands, meeting a friend for lunch, shopping, whatever… I’ve been wearing a shirt, a skirt, and sneakers. Over and over. White tee, denim skirt, sneakers. Again and again. When it was a gorgeous, breezy 20° a couple of weeks ago, I wore my (very) old Burberry denim skirt, and my sneakers, with a sleeveless, slubby white tee from Vince under my Veronica Beard suit jacket. Liz convinced me to buy the sleeveless tee, what Vince calls a “muscle tank,” earlier in the summer. When I first put it on, I grimaced. “I look like Marlon Brando in A Streetcar Named Desire,” I moaned. “No, no,” she laughed, “wear it as a layering piece.” “Oh. Right. Ha. That’s much better.” Honestly, I don’t know how that girl puts up with me. Then when the weather warmed up. I wore the same denim skirt and sneakers, with my short-sleeve Vince “Essential” tee from 2016. I’ve had so much wear from this shirt. It’s hard to find a tee shirt that suits, don’t you think? The sleeves have to be just right, it can’t be too tight or clingy, the hem has to hit at just the right place, not too short nor too long, the neckline has to be just the right shape. Sheesh. Finding the best tee shirt to suit our bodily anomalies can be complicated. And because I thought that the tee worn tucked in looked dreadful, and untucked the outfit looked unfinished, I tried tying my cream crocheted sweater around my waist. I quite like this outfit. Simple, super casual, comfortable. With the sweater as accessory. Ha. 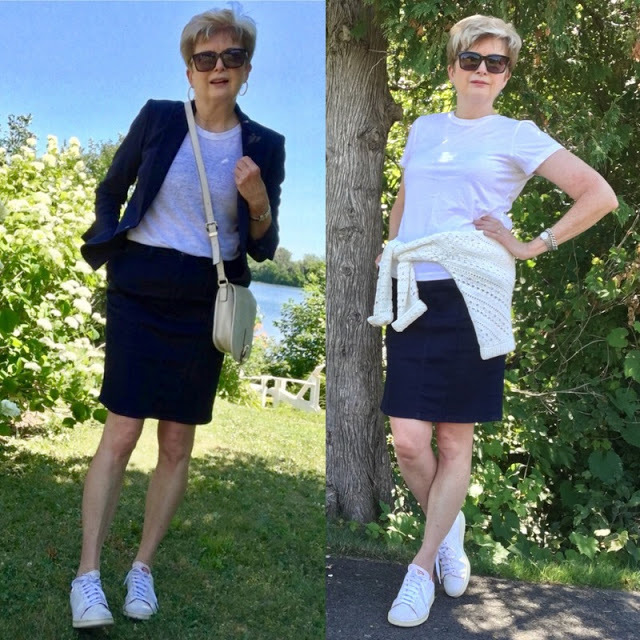 White shirt, skirt, sneakers. Same theme, with slight adaptations. 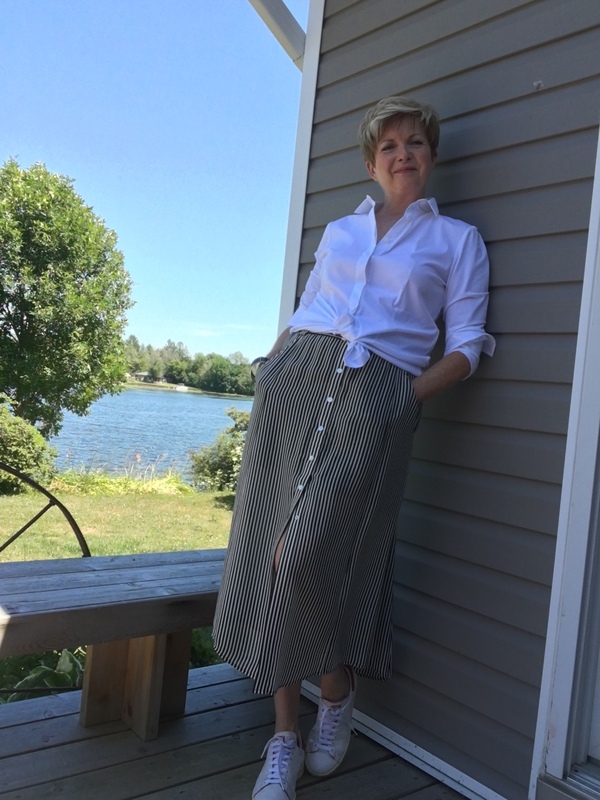 Then to change things up the other day, I wore my striped ALC midi-skirt, with my Lafayette 148 white shirt, and my sneakers. This outfit is surprisingly cool and comfortable. The stretch in the shirt keeps it from looking rumpled. I hate rumpled, which is why I have such a tricky relationship with linen. I know, I know… rumpled linen is chic. I’m trying to embrace it. I am. This Lafayette white shirt is wonderful. The sleeves from shoulder to cuff are a soft, jersey like material, the rest is crisp cotton with some stretch. And it has a narrow silver chain appliqued around the collar. Very much like the Fabiana Filippi shirts which I adore, but can’t afford. I bought it at last year’s Nordstrom Anniversary Sale... and it’s offered this year as well. You know, lately, I seem to be quite comfortable being, well, comfortable. And simple, very simple. Even down to not wearing much jewellry… if any. I’ve begun to eschew earrings many days. I think there’s just something so minimalist and lovely about white sneakers, a white shirt or tee, a skirt… and minimal adornments. Maybe a bracelet, but that’s it. Me leaning against our crooked little house. So that’s my summer style uniform, folks. Three simple pieces: shirt, skirt, sneakers… on repeat. Of course there’s nothing very ground-breaking about wearing sneakers with skirts. I bought my Stan Smith Adidas in 2015, and started wearing them occasionally that summer with a skirt. It’s not a new look … but it’s not old yet, either. And like the now ubiquitous skinny jean, it’s a look I have embraced whole-heartedly as my own. And also like the skinny jean, sneakers with just about everything seems to have style staying power. Thank god. They are sooo very comfortable to wear. Now… a word about our crooked little house. I must have had my i-phone wedged crookedly into my tripod adapter when I took these last two photos. And that evening, when Hubby looked at them, he laughed and said, “They’re crooked, Suz.” Darn. I tried to straighten the shot, but then my feet were cropped out. So crooked house it will have to be. But just so you know… we don’t have a crooked little cat, nor a crooked little mouse, and, most importantly, we don’t have a crooked little house. Ha. Now, over to you my friends. Do you have a favourite summer style uniform? P.S. I don’t always provide shopping links, for reasons I’ve stated before. But if you think you might like either of these Vince tees, the Essential tee can be found here, and the muscle tank here. I’m wearing a size large, and a size medium respectively. The Lafayette 148 shirt is still on sale at the Nordstrom Anniversary Sale. Here’s the link. I’m wearing size 10. Please note…the prices quoted are in CAD. Bit more pricey than in American dollars. Ha. Well-turned ankles! Such a good phrase and so apt:). You really do find uniforms that suit you. Thanks, Lisa. I remember my mum using the expression "neat ankles." I think that means slim. Words are wonderful, aren't they? Grrr! The comment I tried to leave via iPhone didn't make it past some Google gatekeeper that wanted to play games. I said I loved these iterations of a great uniform. Not sure I'd say I have a summer uniform, but I've been wearing simple dresses as often as possible, paired with either my sneakers (gold metallic) or my Birks (white Arizonas). I don't do heat well, and we're enjoying a succession of sunny days, so comfort is my prime consideration. . .
Oh… sorry about that Frances. Goggle has made a few changes that have had me groaning lately. I am no longer able to get e-mail alerts that there is a comment on my blog. They say they're aware of the issue and that "the team is working on it" but it still makes trying to stay on top of comments more difficult. I so envy you your white Birkenstocks. Wish I could find a pair or something similar that fit me. A low slung belt would look good to over the T if you don't like it loose. Thank you for the links. I like your uniform and summer styling very much Susan . I'm also a bit jewellery minimalist this summer. Thanks, Anna. I'll try that. Great combinations for warm weather … it does help, I think to have a “summer uniform” and to know what suits you, works well and feels comfortable in the heat. I have one very old pair of loose PJ bottoms which are only suitable for camping. Ha. I must see if I can find some on sale this summer. They are so very comfortable for lounging around the house. Nice crooked house:-) Have you been to the Crooked Tea House of Windsor? Lovely! Thanks, Dottoressa. I may have to invest in another loose summer dress before the seasonal sales are finished. Only thing is I like that look with sandals, and I seem to be only wearing sneakers these days. My flat sandals are giving me some foot grief. I love the longer skirt on you, very elegant, and comfortable looking. Effortlessly chic as they say. Thanks, Kathy. That skirt is so light and cool for hot summer days. You know, I think it is a mark of fashion maturity to recognize what looks right and what looks wrong (or unflattering, I guess I mean)on our bodies. I know the mantra is that we can wear whatever we want, and of course we can do just that if we want. I agree that we shouldn't be dictated to by anyone. But I also know that there are looks that just don't translate well on my body. Wide cropped pants, belts over anything, tucked in anything unless with a jacket… to name just a few. Hope you like the Susie Steiner books, Iris. Hubby is currently reading the second one and agrees with me that it is even better than the first. I read your blog faithfully, and enjoy it. Nice that it is from Canada, where the weather is different from California and the culture is different from New York. I live in Edmonton. I used to like to wear skirts in summer because they are cooler than pants. One of the many insults of aging (for me) is the need to wear knee-high compression socks, thus requiring pants or maxi dresses (which I don't much like). And t-shirts, which I also love, are challenging because of the "muffin top" that suddenly appeared when I turned 70. Muffin top is one of my challenges. So I can no longer wear the slim fitting tees that I wore all through my thirties and forties. I imagine that compression socks are really limiting… especially in the summer… I'm not a big fan of maxi dresses, either. 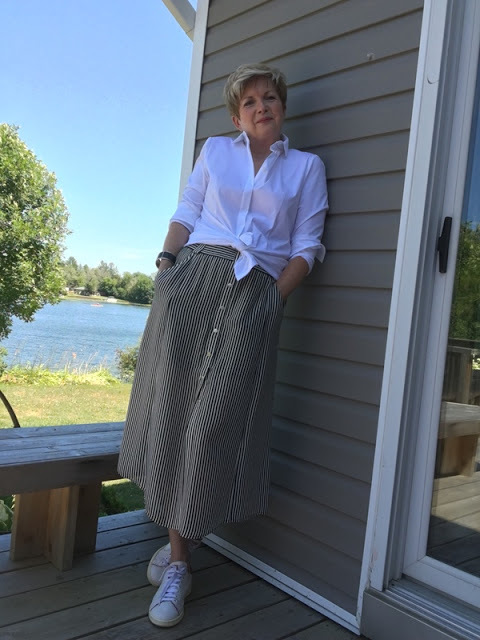 Love these simple styles for summer and like you wear skirts because I find they are cooler in the heat than shorts or pants. Also like dresses that allow the air to flow up and down but I tend to wear sandals rather than sneakers as they are cooler on my feet on the very hot days. I also like linen as it's so cool and comfortable to wear and I don't mind the rumpled look. You always inspire and like others have ordered the Susie Steiner book from the library. I have always worn mostly sandals in the summer too. But I don't like my flat sandals with skirts anymore… probably because that denim skirt needs something more "weighty" on the bottom. Same for the longer skirt. When I try them the proportion looks all wrong. Hope you like the Steiner book, Christy. Those outfits look perfect for retired life in the summer, "effortlessly chic" as others have also said. Can you comment on the socks (sockettes?) that you like to wear with your sneakers? Ah… there's the rub… so to speak. I prefer the "sockettes" that you can't see but darned if I can find ones that don't disappear down into my sneaker after a few minutes. I've tried several brands over the years… and now just go barefoot. It might be the "profile" of the Stan Smith sneakers because I don't have that problem with my runners. Loving the tee, skirt and sneakers look on you Susan. i need to start wearing my sneakers as I just bought a pair of converse i enjoy wearing. i used to think fashion shows deemed "comfort' as a 4 letter word! But this proves that you can be stylish and comfy too!